Economic opportunity has always been the prime force behind waves of emigration—usually in a single direction. But sometimes, over the long term, the pendulum swings both ways, which is the case with Europe and Latin America and the Caribbean (LAC). In its new study, “Migratory Dynamics in Latin America and the Caribbean, and between LAC and the European Union–May 2015”, the International Organization for Migration (IOM) analyzed the migration trends between this regions, focusing in the 2010-2015 period. Starting in the end of the 15th century, the Age of Discovery marked the beginning of the first wave of European migration to LAC, followed by the European colonization of the Americas, a period of predatory harvesting and mining of the natural resources, slavery, and submission of the native population. Most of these migrants stayed for short periods, seeking fast enrichment, and many were repelled during the wars of independence, which ended this era. About the 1830s, a second migration wave of Europeans towards LAC starts. This second moment is quite distinct; as the Europeans who seek their fortunes in the New World went to stay and influenced significantly the culture and the genetic stock of LAC. After the World War II, the need to reconstruct Europe and the labor-force demands in France, Germany, Switzerland and the Netherlands diverted the Spanish, Portugueses and Italians—the traditional main source of European migration to LAC—to the interior of Europe. 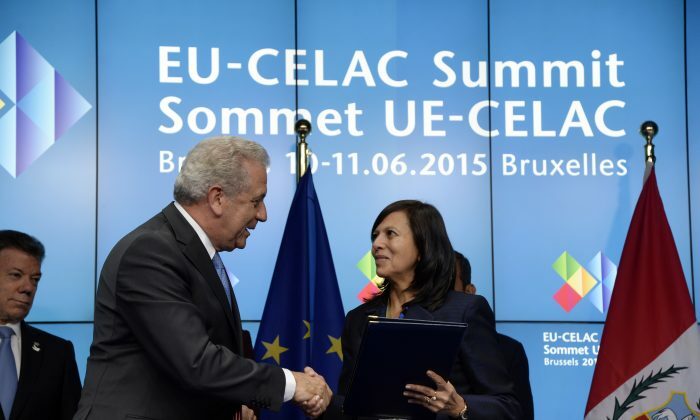 By the middle of the 1970s, European migration to LAC practically ceased. In the 70s and 80s, LAC migration to Europe starts and it is primarily of political character, when exiles were pushed out by repressive regimes. In the 80s, LACs migration also begin to diversify, a fresh wave of students went to Europe to further their studies, and a debilitated middle class—affected by the economic crisis in LAC—looked to the Old Continent. This process continued through the 90s and the beginning of the 21st century mainly as a labor migration, but the 9/11 incident in the United States and its results—increased border/customs control and restrictions—helped intensify LACs migration to Europe. Today, the pendulum has swung back again. With Europe suffering the sting of the economic crisis since 2008, a third wave of Europeans—especially the youth—are looking to LAC countries as a new horizon of opportunity, while LACs migration to Europe is declining. “In recent years, changes in migration flows between Latin America and Europe show once again that these flows naturally evolve according to socioeconomic fluctuations and that they have the potential to act as a tool for adjusting and responding to structural economic crises,” explains Laura Thompson, assistant director-general at IOM, reported MigraMundo. The most distinct features of this third wave of European migration toward LAC is probably the diversification of sources. Historically, Spain, Portugal, and Italy were the primary sources of migrants to LAC. But since 2008, Frenches, Germans, and other Europeans joined the traditional migrants. For example, “the recruiting agency Monster estimates that 56,000 French, 33,000 Italians, and 32,000 Spaniards are looking for employment in [Brazil],” says an IOM report. Another feature is that while the 1st wave was composed by trail-blazers and profiteers and the 2nd mostly by families and middle-lower classes, this third wave is largely composed of highly educated, single young men—principally in social sciences and engineering—looking for opportunities in the developing and emerging LAC countries and hoping to advance their careers. Facilitating this process, there are many LAC corporations that value the European education, which is rewarded with good salaries, posts, and promotion prospects. This competitive advantage over the local population gives Europeans a stimulus to migrate, instead of facing the highly competitive and shrinking EU job market. Angel Lopez, 27, of Spain is a clear example. From an unpaid trainee in the TV Canal 9, he became media-director in a big company in the education sector in Peru, reports the BBC Brasil. Ana Bobo, 38, has a similar story. Her employer, a marketing agency in Madrid, faced a downturn losing 50 percent of its business. “I started thinking about my future and talked to a lot of people. Soon I realized there was no place for me in Spain,” she recalled. She ended up in Santiago, Chile, as marketing-manager in a financial company. “The ‘European brand’ is still a big asset here. If you have the skill, you have a great advantage,” she said. The EU economic crisis has directly impacted its labor market making many Latin Americans avoid the EU as a prospective destination, reducing the migration flow. Some Latin Americans already in the Old Continent have even left as a result of the economic situation. “Migrants tend to be more affected in recession periods than natives due to the low qualification kind of job they usually do and the discrimination to which they are exposed,” states the IOM. 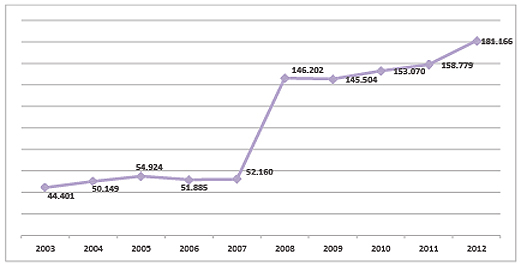 The number of LACs who have returned home, however, is relatively low. For those who were able to set a stable foot in Europe—to hold a job and survive the challenges of a distant homeland, family, and friends—its better living standards, infrastructure, and welfare, and the significantly less violent environment are good reasons to stay. Before the economic downturn, between 1999 and 2007, the LACs flow to Europe had increased six-fold. 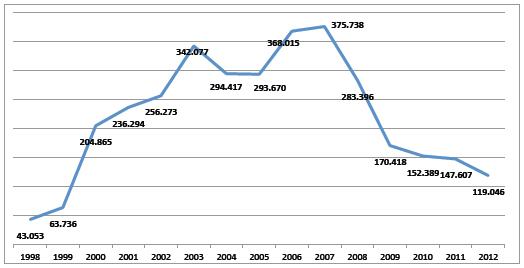 In 2008 and 2009, this flow fell significantly from the peak level of 2007, with the following years continuing the downward trend but at a slower pace. Lighter custom policies in the United States in the last years also strengthened this traditional and favored route for LAC migrants, diverting and weakening the flow to Europe.